Tariffs aside, globalization is here to stay. With the evolution of technology, our world gets smaller and smaller. Likewise, even the smallest business is now able to reach territories further and further away. This means connecting with people and authorities of all cultures, some that you may not yet be familiar with. But how do you get along with people that can be so different? Here’s a simple answer - DISC has always been a tool to understand people and predict their behaviors. We can fairly state that DISC is the international language of human behavior and no matter of cultural differences, DISC personalities speak the same language. As a business professional, you may have already encountered unsavory experiences due to culture clashes and differences within the corporate business structure. When understanding how globalization impacts business, we must first realize that ultimately, we are in the business of “people.” No matter what your product or service actually is, you are always listening to the needs of your customers and/or clientele. You are interacting with vendors and distributors across the globe. You are building teams, and you are targeting new audiences. Why is DISC theory important to globalization, and why aren’t you already implementing this into your 2019 plans for international expansion? The answer to the first question is simple. We are dealing with people of other cultures. There are various traditions in play. There are 4 main personality types and 41 possible style blends which we must approach in business. We need to revisit our strategies for communication, marketing and compliance. By doing so, we can improve our market position, increase customer satisfaction and strengthen our teams from within. Take, for example, a business that has decided to expand into a more traditional territory. If the business hasn’t done the necessary homework, it may be doomed and unlikely to succeed from the very beginning. Businesses that have done the much-needed homework, however, may just find that those new territories are more fruitful than those they have already established a presence within. Utilizing DISC theory, we can cut corners and ensure success from the launch of business in each new land that we decide to conquer. Depending on the resources available to your business endeavors, there are two different routes that can be taken in effort for expansion and globalization. The first route would ultimately be to build teams in the territories where we wish to conduct new business. This means scouting, vetting, and training top talents in each new area while integrating the company’s vision into a separate culture abroad. Click here to learn more about using DISC when hiring top talents. In order to be productive, we must be willing to communicate regularly and evolve to meet the needs of other team members. This means adjusting our styles to “fit” into the culture of that community or team. Recognizing the important contributions each team member brings to the team in an important step to improving morale and productivity. We need Advocates* and Communicators* who will charm and create a positive environment for our mission. We need Chancellors* that will fight the good fight on our behalf, and effective Attainers* or Establishers* that will do “the dirty work,” as we expand. The other option is to “wing it” by bringing our own teams. Bring on a Governor* or a Mediator* to build relations, a Precisionist* or a Peacemaker* to oversee all details and a Director* to make sure he keeps the big picture and the master plan in line. Do not get confused with these names – they are not job positions but designations of DISC Style Blends. Download all PeopleKeys DISC Style Blends here. 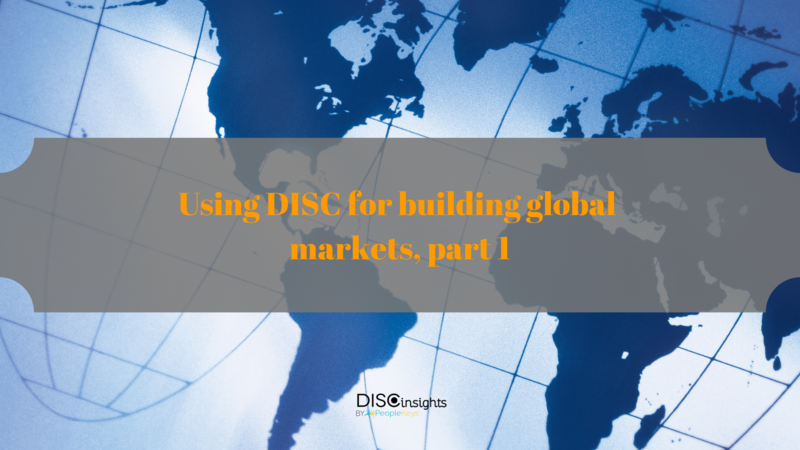 Read more about Implementing DISC for globalization and interaction with outside cultures and applying DISC for strategic partnerships, pricing and vendor negotiations in part 2 of this series.